Whether you are looking to raise capital or to secure a better deal, if you own two or more buy to let properties, you may be wondering if it is possible to remortgage your buy to let portfolio. Options for landlords who own more than one property include taking out a buy to let portfolio mortgage for multiple properties or individually refinancing your each buy to let property. From 2017, private landlords will not be able to deduct their buy to let expenditure to calculate their profits for their self-assessment tax return. Though some private landlords may wish to set up a limited company to avoid these new rules, they will incur some additional costs to do so. Another way in which private landlords may be able to combat the effect of the new tax rules on their finances is to remortgage their buy to let portfolio. There are a selection of lenders that offer specialist buy to let portfolio mortgages, which allow landlords to consolidate any existing buy to let mortgages into a single buy to let portfolio mortgage. However, from 2017 changes have been implemented to how the buy to let mortgage market is regulated that may make it more difficult for landlords to remortgage their buy to let properties. Unlike pre-2017 buy to let mortgages, where lenders would consider the landlord's buy to let properties independently, lenders will now have to review the landlord's portfolio in its entirety. This means that landlords can no longer spread equity across their portfolio. Therefore under the new rules, if a landlord has 5 buy to let properties and only 3 of them are profitable, a lender may decline the landlord's application on the basis that only a portion of the landlord's portfolio is profitable. In addition, traditional lenders will have to implement a stricter stress test to ensure that a landlord's portfolio can withstand an interest increase up to 5.5%. Also traditional lenders will require landlords to have a rental coverage ratio of at least 145%. This may make it tougher for landlords to remortgage their buy to let properties, as they cannot simply raise the rent on their application because lenders will require a surveyor's valuation to support landlords' rental coverage ratios. Private landlords may also want to consider remortgaging their buy to let portfolio on an individual basis, where they would need to refinance each property separately. One of the advantages of remortgaging a property is it lets the landlord return to an introductory rate, potentially saving them money by moving away from a lender’s Standard Variable Rate. Landlords may want to consider to what sort of introductory offer they feel would be best for their property. Fixed Rate – As the name suggests, it offers a fixed rate of interest over the course of the introductory term. This means landlords will know exactly what their monthly mortgage payments will be. Tracker – The interest rate landlords pay may fluctuate in response to changes made to the base rate set by the Bank of England. This means it could cost landlords more if the base rate rises or less if a reduction is made to the base rate. No matter the size of your current rental property portfolio or the motive behind your desire to remortgage you might benefit from seeking the assistance of a professional, independent mortgage adviser. 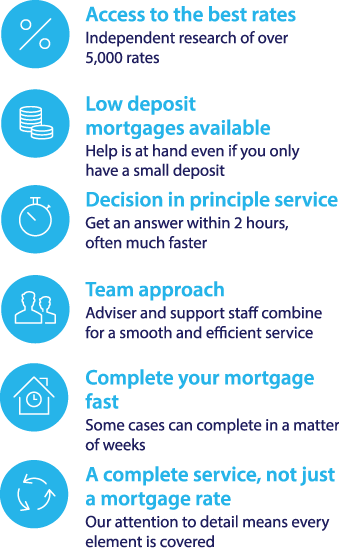 Not only can mortgage advisers offer impartial advice to borrowers throughout the remortgage process, but advisers who offer a whole of market service can use their expertise to find you the most suitable products available for your needs. There are also certain mortgages available from specialist lenders, not available on the high street, which can only be accessed via an intermediary such as a mortgage adviser. Fair Mortgages offers a whole of market mortgage intermediary service. If you want to find out if Fair Mortgages could help you, you can fill in our online contact form to request a call back and receive a free initial consultation from a Fair Mortgages adviser. Alternatively, you can get in touch with us directly by calling 0117 403 4222.